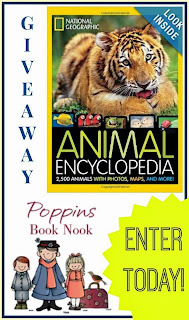 The theme for Poppin's Book Nook this month is Animals/ Pets. This was a very hard theme for me not because there are not many books, but because there are SOOOOOO many good books! Besides we are animal lovers around here, and we read a lot of books about them! 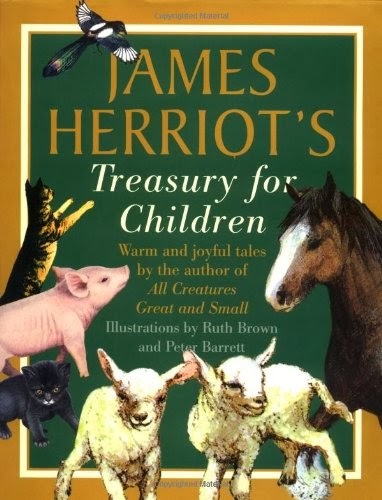 After a lot of thought I decided on James Herriot's Treasury for Children. 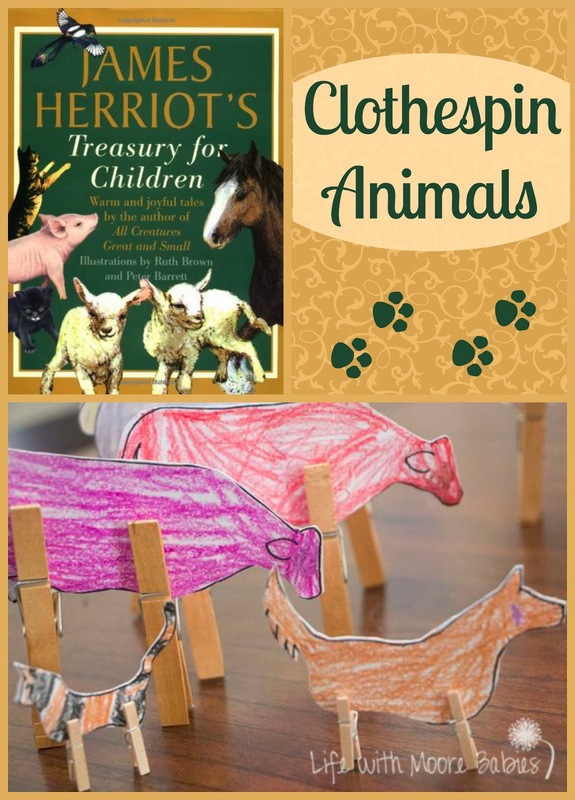 Most of us think of the All Creatures Great and Small series when we hear Herriot's name, but he wrote several stories for a younger audience all based on his veterinary adventures. Each story retells a case he had (many unusual ones) and how the people involved were affected. That is what I appreciate most in his writing, while he shows obvious concern for the animals (as any veterinarian would), he also shows the larger reason many of us became veterinarians, to help the people who share our love of animals. The significance of the human animal bond shows up in all these stories whether the main animal is a typical pet like a dog or cat or a farm animal! 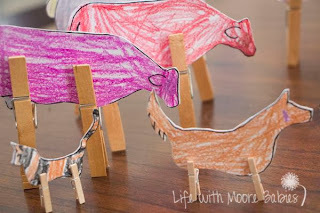 After reading all these touching stories we made some clothespin animals we could use to retell the stories or make up our own. I wasn't sure if there were any patterns available for clothespin animals, and honestly I didn't even take the time to looks. 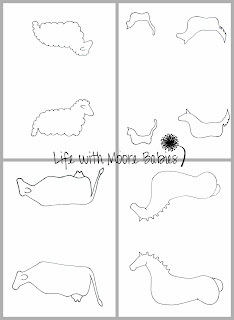 I just sketched out some animal outlines and copied them for the girls. Then they got to work coloring them. We had some normal colored animals and some crazy colored animals. 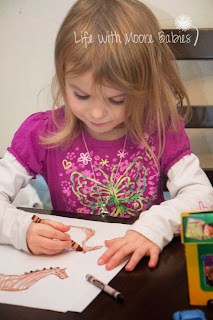 Silly me thinking they would color them like the book! Even Eli had to make at least one! Once they were colored I glued them to card stock and cut them out! 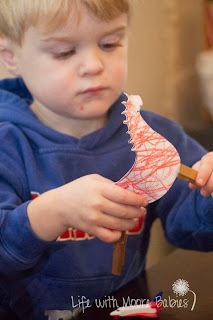 Then you just add some clothespins and play! 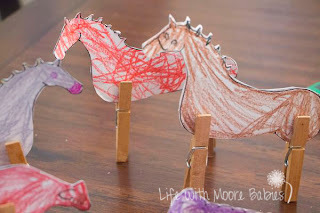 I had mini clothespins for the small animals and regular ones for the large animals. 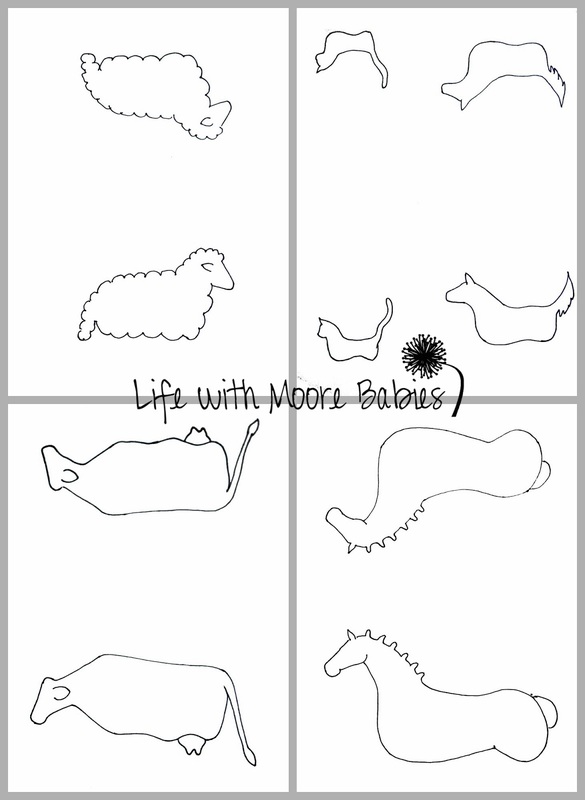 I really could have used some medium ones for the sheep, but that didn't happen, so our sheep have tiny legs! 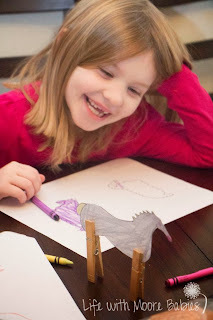 I have included a PDF of our patterns if you want to make some of your own. 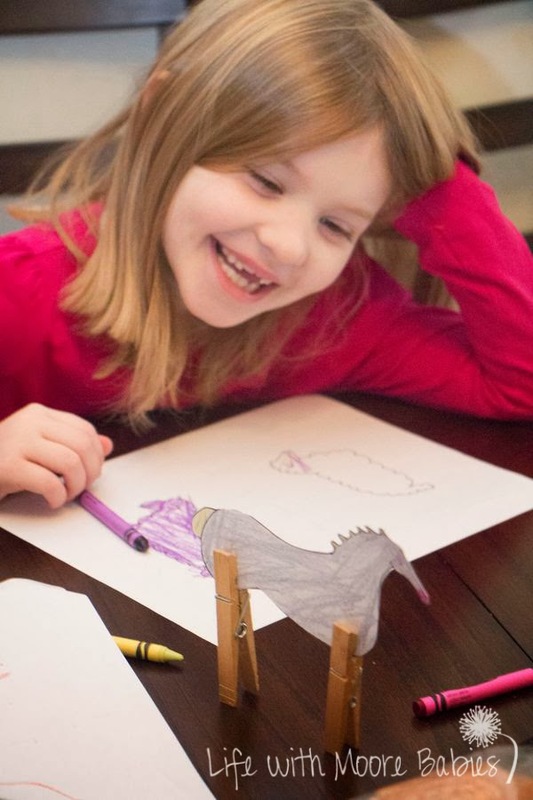 Each page has 2 copies of the animal, so you child can color the animal, and then you can fold it and glue it before cutting. 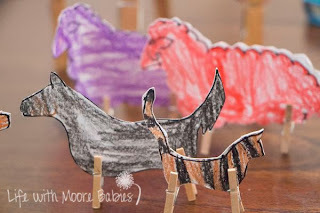 If you print it on card stock you will just be able to glue it to itself, but if you can't find your card stock when you want to do it you can always glue the animals to card stock or cardboard once they are colored (that is what we had to do). One tip is once the animals are colored, fold the paper in half while holding it up in the light, so you can make sure the animals are overlapping. Then all you have to do is glue and cut! 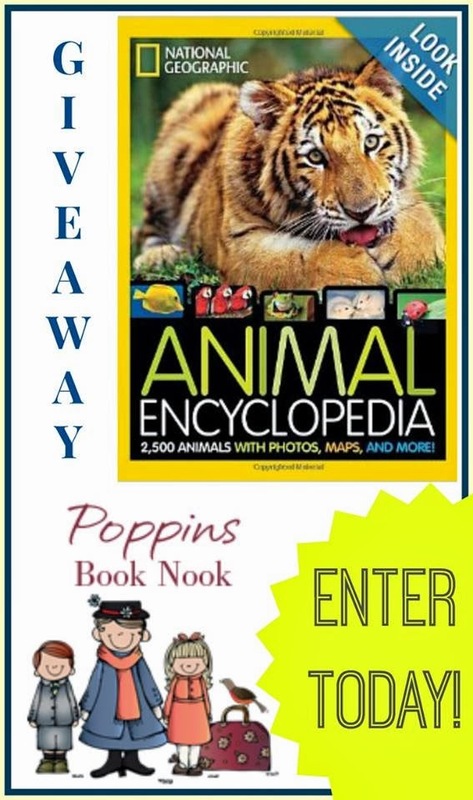 This month we also have a fun Animal Encyclopedia to give away to one lucky Poppin's Book Nook reader (US residents only please)! 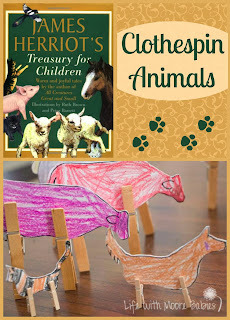 Make sure you visit all the amazing blogs participating in this book club and check out their animal adventures! We are taking the month of December off, but we will return in January with some Greek Mythology!